Michael Leahy is one of 56 students at Vineyard Montessori, which continues to expand programs. Arin Atema, age nine, thinks the President of the United States made a serious error when he declared Jerusalem the capital of Israel at the end of last year. It would be tempting to call Arin precocious, but this kind of musing is common among his peers at the Vineyard Montessori School. So common, in fact, after spending time at the school, it seems strange we ever expect anything less. 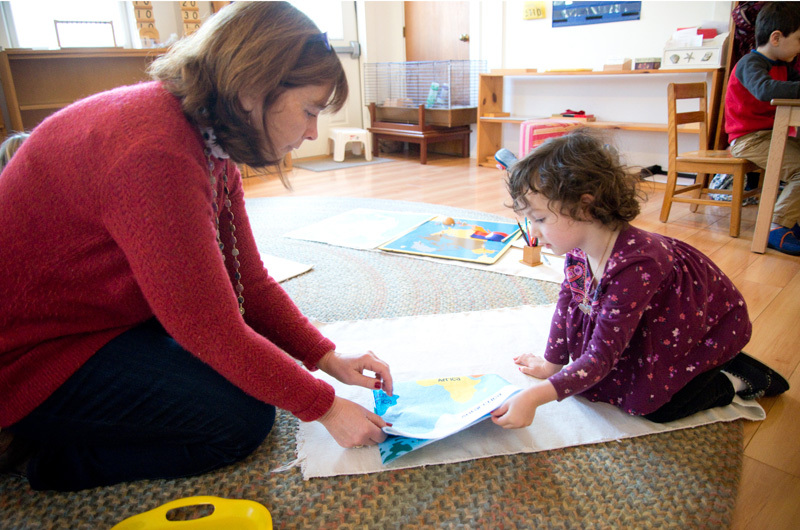 Vineyard Montessori, long a presence on the Island as a preschool, has expanded in recent years into the lower grades. Now the school is ready to expand again, and next year will offer classes from pre-K through eighth grade. An ambitious expansion plan, called the 2022 Vision, aims to raise significant funds to build a new facility on school grounds in Vineyard Haven in the next four years. “We have no space at all,” said head of school Debbie Jernegan, who has led the school since 2012. Current enrollment is 56 students. “It’s really tight. We have no community room. We have no place to do a production or for kids to do sports,” Ms. Jernegan said. Founded in West Tisbury in 1975, the school migrated to a few different sites down-Island over the next decade, eventually settling in a small building in Vineyard Haven with three tidy, light-filled classrooms. In March of last year, the school bought the property adjacent to its main campus for $592,000, more than doubling its size. That was a step toward achieving the vision which Ms. Jernegan says includes a new net-zero facility complete with updated science labs, outdoor learning environments, a communal space and potentially a gymnasium. Early estimates for building costs are between $6 and $8 million. The vision also includes making the school available for children from all economic backgrounds. The annual tuition is $11,000 for full-day students, putting it out of reach for many Island families. School leaders and parents are looking to expand scholarship op portunities. Middle school students currently study in classrooms at a temporary satellite campus at Camp Jabberwocky, which has a three-year lease agreement with the school. Students don’t seem bothered by the two campuses or by the close quarters. Arin commutes every day from Falmouth to join his six classmates in the Elementary 11 class at the satellite campus. “Hopefully as far as I can go in Montessori I’ll stay here because I absolutely love it,” he said. He transferred to the school this year. 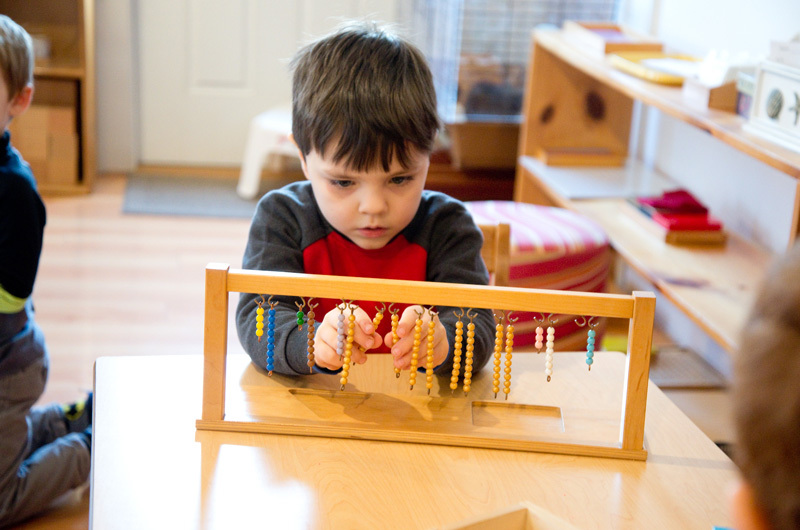 In the Montessori classroom, there are no wall-to-wall chalkboards, no desks and no grades. The room is or derly and organized, and children are expected to take ownership of their environment. Children of different ages work together, with older ones teaching the younger ones. They follow individual learning plans and set goals for themselves. The Montessori method, named for Italian teacher and doctor Maria Montessori, is based on the observation that when given the opportunity, children will teach themselves, and that the drive to learn is innate. Maria Montessori founded her first school in 1907. According to the American Montessori Society, there are now more than 22,000 around the world. Alumni of some of those schools include Jeff Bezos, CEO of Amazon, and Google founders Larry Page and Sergey Brin. Emily Clatworthy, age six, has recently spent her time in Elementary I recreating a map of the United States, punching out the shape of each state and gluing them together. She’s on her way to learning the whole world. “I haven’t even done Asia and Europe, and I’ve already done Africa. It’s crazy,” she said. Her five classmates in Elementary I are also working on world geography. They start by putting together puzzles in the shape of each continent. Later they move on to creating the maps themselves. When they’re not in the classroom, they garden, go skating at the Island ice arena or visit the Martha’s Vineyard Museum in Edgartown. They’re also putting together a play, titled Trouble with Trolls. Gracie Coggins, age 10, and Connor Graves, 11, spent that time in the Elementary II classroom compiling a color coded timeline of the history of ancient Africa spread out on the floor. They held pictures of Egypt’s first pharaoh, a horse-drawn chariot, and “shaduf irrigation” to be placed on the timeline in the order they happened. Gracie said she was working on a 3D diorama of shaduf irrigation to be presented to the class the following day. 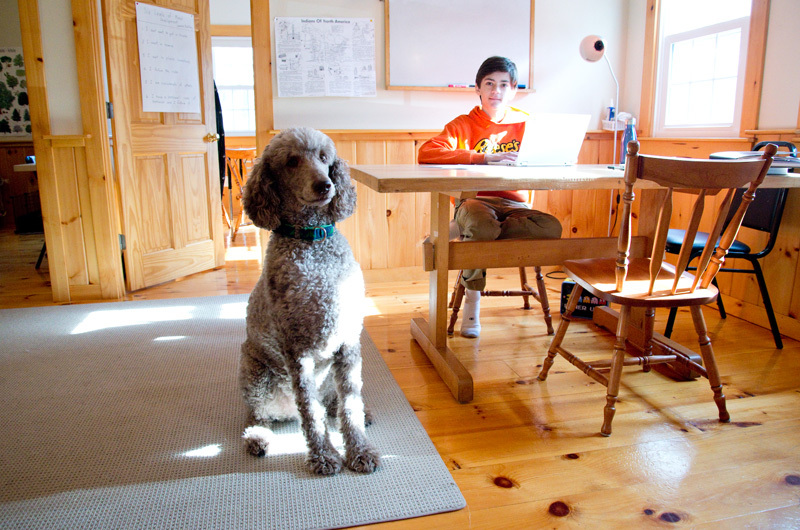 The school’s only seventh grader, Matthew Coggins, worked one-on-one next door with teacher Ty Johnston, while Ms. Johnston’s dog Monty sprawled on the floor. Matthew’s favorite subject is math. They’re working on pre-algebra, scientific notation and complicated exponents. “I can’t say that I’ve ever had a shortage of assignments,” Matthew said. Recently, on top of his regular workload, he’s spent much of his time preparing to compete in the model United Nations in New York city in March. Next year, four other students will move up to the middle school level to join him, but Matthew has been the pioneer in older grades at the school for several years now. Matthew will go to high school at the Martha’s Vineyard Regional High School year after next. He isn’t nervous about the transition, he says.